H.M.S. Minotaur was a 74-gun Third Rate Ship of the Line built at Woolwich and launched in 1793, length 172 feet and burthen (fully loaded weight) 1721 tons. She was one of the Leviathan/Colossus class of 74s, built to the design of the captured French ship the Courageux. Note that in this context "Third Rate" does not mean "inferior quality", but refers to the system of rating ships by size and number of guns. Third Rate ships were two-decker ships with between 64 and 80 guns, and were the smallest category of ships considered capable of taking part in the line of battle. 74-gun ships like the Minotaur were the most common and most effective Third Rate ships. 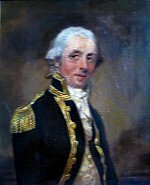 From the 23rd March 1794 to the 3rd March 1802 the Minotaur was under the command of Captain Thomas Louis, later Rear-Admiral Sir Thomas Louis. In 1798 the Minotaur took part in the battle of the Nile under the command of Captain Louis, during which he earned the personal thanks of Nelson for the support the Minotaur gave to Nelson's flagship Vanguard by engaging and drawing the fire of the Aquilon. The Minotaur forced the surrender of the Aquilon with the assistance of the Theseus. The Minotaur's casualties were 23 killed and 64 wounded. In May 1800 The Minotaur, under Captain Louis, carried the flag of Vice-Admiral Lord Keith at the siege of Genoa. From the 11th March 1803 to 17th November 1807 the Minotaur was under the command of Captain Charles John Moore Mansfield. In May 1803 commanded by Captain Mansfield, the Minotaur, together with the Thunderer and Albion, captured the French frigate Franchise. The Minotaur, under Captain Mansfield, was in Collingwood's Channel fleet watching the French fleet off Brest. Collingwood transferred his flag from the Venerable to the Minotaur for a few days in August 1803 while the Venerable went into Plymouth to replenish stores (5 August 1803 to 22 August 1803). In 1805, as part of Nelson's weather column, she fought at Trafalgar under Captain C.J.M. Mansfield. The Victory at the head of the weather column sliced through the combined French and Spanish fleet, cutting their vanguard out of the battle. When the French and Spanish van eventually turned about, and five of them returned towards the now badly damaged Victory, The Minotaur together with the Spartiate, being at the end of the line, took them on and forced the Spanish 80-gun Neptuno to surrender. Click here for the Captain's Log. From the 27th June to the 22nd September 1806 the Minotaur carried the flag of Rear Admiral Purvis, Collingwood's second in command. In 1807, in Admiral Gambier's fleet, the Minotaur, under Captain C.J.M. Mansfield, and carrying the flag of Rear-Admiral Essington, took part in the second battle of Copenhagen . The battle was a decisive, if controversial, victory with Copenhagen and the entire Danish fleet captured by the British. Captain John Barrett took command of the Minotaur on the 18th November 1807 for a brief period, and then again from the 18th March 1809. In 1810 on 22nd December, under the command of Captain John Barrett, the Minotaur was wrecked in a gale on the Haak Sands off the mouth of the Texel, with around 370 of her crew lost, including Captain Barrett. Click here for more about the shipwreck, including the tragic tale of Lieutenant Salsford and his pet wolf. This site is being built by descendants of Captain Mansfield. Research is continuing - please contact us with comments or information.